Perfectly captured, who could resist the imagination of the young. I love all the details with fairy doors too. These ones were so pretty. It’s so sad when they go missing though – the fairy village in this photo has been vandalised a couple of times and I can never understand why someone would feel the need to destroy something like this. What a cute little fairy door…was anyone home? Thanks Darren – we did try knocking but the fairy didn’t seem to want to come out and play. What a cute photo. She looks intrigued by it! 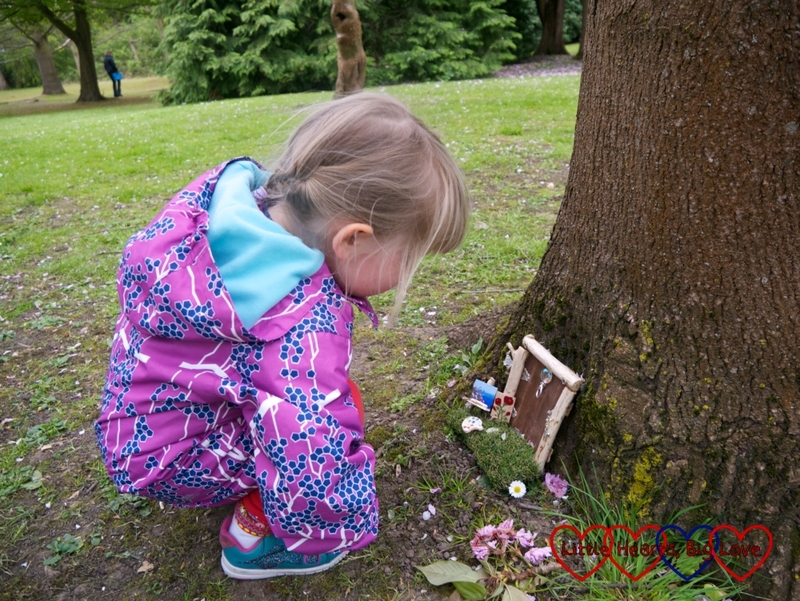 Such a cute photo, I do love fairy doors, unfortunately my girls are a bit too old. I might see if I can get them interested in making some fairy gardens this year though. Love the idea of Fairy Doors. As soon as we have our garden done nicely we shall be placing Lily’s in the garden. Aww that’s adorable. I love a fairy door, the girls get so excited about them, there’s nothing more magical.